The stage race will be the British pair's first major event since the Tout de France, which Geraint Thomas won. LONDON (AFP) — Tour de France champion Geraint Thomas and the man whose crown he took in July, his teammate Chris Froome, will compete in next month’s Tour of Britain rather than the season’s final grand tour. Both Team Sky riders have rarely graced their home Tour in the past decade. Thomas finished seventh last year in what was his first appearance since 2011, while Froome last competed in 2009 and finished 50th with his previous team Barloworld. Thomas, 32, was only drawn to compete in 2017 because the race ended in his home city of Cardiff. He was lured back this year for what will be his first major race since the Tour de France. The British tour begins September 2 at Pembrey Country Park in Carmarthenshire, Wales. The Vuelta a España gets underway on August 25. “As soon as I’d finished the Tour [de France] I knew I wanted to ride the Tour of Britain and race on home roads,” Thomas said on the Team Sky website. “It starts in Wales, which will be special, and then I get to go and race across the whole of the United Kingdom. I can’t wait. 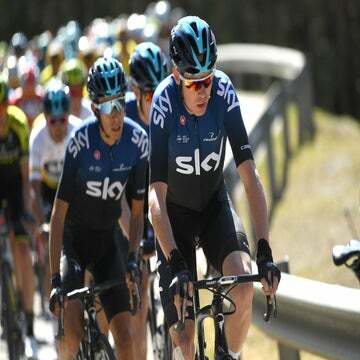 The four-time Tour de France champion Froome, who finished third behind Thomas in this year’s Tour, said he focused on the Vuelta the past four years before finally winning it in 2017. “It’s been a long time since I’ve raced the Tour of Britain,” said Froome. “The Vuelta a España has always been such a big goal and sadly coincided with the Tour of Britain, but not doing La Vuelta this year gives me the chance to come back to the UK and race on what looks like a great parcours. “I’m really looking forward to riding. I always remember there being a great atmosphere at the Tour of Britain and the race has only got bigger over the years. I’m really looking forward to coming back,” added the 33-year-old Kenyan-born star. Surprisingly given their dominance, especially at the Tour de France, Team Sky has only won the Tour of Britain once — when Bradley Wiggins prevailed in 2013. Following the start in Wales, this year’s race will take riders into the West Country and up to Cumbria before returning to its regular finishing circuit in central London on September 9.